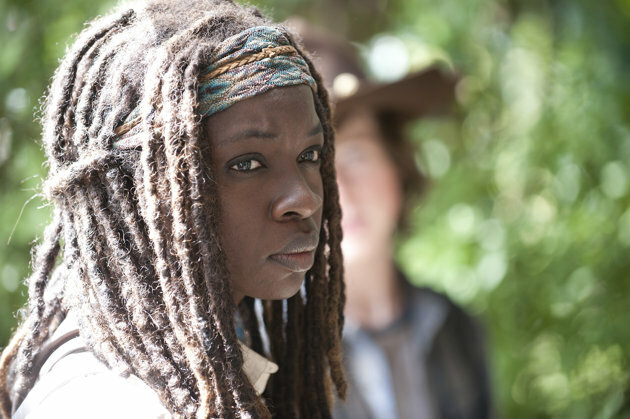 This week’s episode, “Claimed,” showed us that Michonne has a soft side and Rick won’t let a beat up body slow him down. For a moment at the beginning of the episode, we get a lighthearted feeling that is rare and fun at the same time. Karl and Michonne are eating cereal minus the milk, laughing and talking about the good old days, but then that quickly changes when Judith is brought up. Karl has learned at this point on the show, with all the time that has passed, to develop a thick skin and not let his emotions get the best of him. He tries to sink down the memory of Judith, just like that of his mother and his pseudo-stepfather Shane. Karl and Michonne go off to get supplies, while Rick stayed home doing the dishes and cooking. Gosh he is such a good little housewife. They tell him to rest up and save his strength. Off they go searching for food and Michonne sees that Karl is sad and tries to lift his spirit with some canned cheez-whiz that she had found. Karl doesn’t laugh and she says that “toddlers find me funny.” Which sparks Karl’s interest and she suddenly reveals, oh yeah by the way I used to have a kid. Karl wants to know more and slowly, but surely gets more out of her while they rummage through houses. In a spine-tingling moment, Michonne opens a child’s room in the house and finds the corpses of a family, kids and all and it is apparent that they must have lost hope and killed themselves. She refuses to let Karl see and in a sense believes he has probably seen enough horrible things for one lifetime. Meanwhile at the house, Rick tries to lie down and enjoy a good book, Jack London’s White Fang, when suddenly he hears noises. A group of men enter the house and start ransacking it, Rick rolls under the bed to hide. This was a great classic horror movie scene, Rick is sweating and his clock is ticking and one of the guys lays on the bed. Another guy comes in and they start fighting and suddenly he puts the guy in a sleeper hold and knocks him out. If they will do this to a comrade, what will they do to him? This was a real nail-biter moment and I applaud them for giving us more of these feelings. The show is beginning to feel the way it did the first 2 seasons, where uncertainty loomed around every corner. 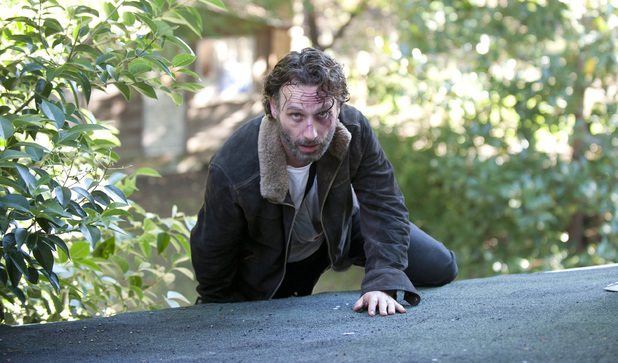 In usual Rick fashion he escapes by going through the bathroom window and in doing so kills another guy who was in there just trying to take care of his business. 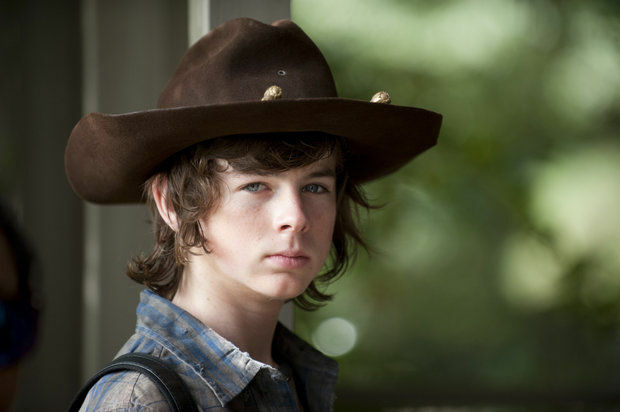 He hangs out under the porch and waits for Michonne and Karl to come back, they run off and start walking by a train track. They see a sign for Terminus and decide to go that way. Kumbaya the gang will be back together soon, remember Carol and Tyreese and the kids were going that way too. Glenn and Tara also make an appearance with the new characters, Abraham, a former Sergeant in the Army, Rosita his lover slash GI Jane chick, and Eugene the scientist. Abraham says that Eugene has the cure for what is going on and they must go to Washington DC to relay this info and save the world. 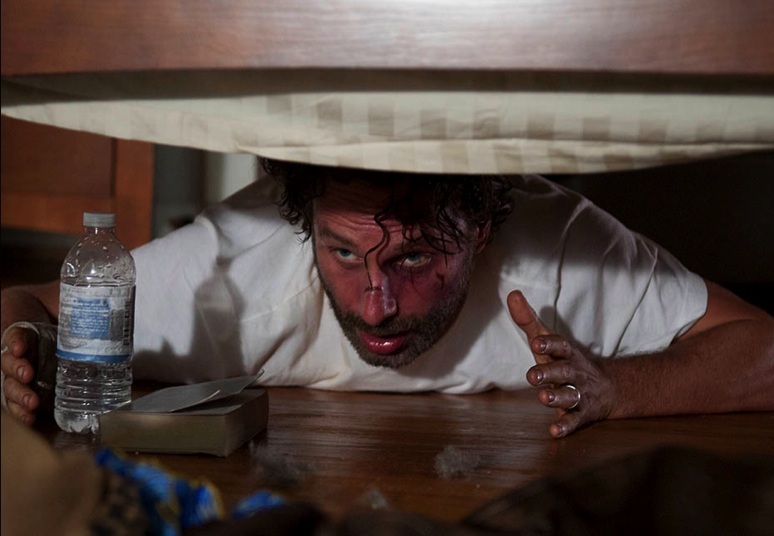 Despite this miraculous guy who will save the world, Glenn does not want to go, he wants to find Maggie. It seems that love is persevering over world peace, good job Glenn. This brings Glenn and Abraham into a battle where they start fighting, meanwhile, walkers start coming out of a cornfield and Abraham starts shooting like a fool. Eugene puts bullets in the gas tank and now their wonderful military vehicle is disabled and they must walk on foot. They decide to head back the way they were coming, where they will end up who knows? I am guessing Terminus perhaps? Is Terminus really good or is it just like the Governer’s idyllic community? Sweet thanks Rob! Yes it is good, its a mix of horror and almost has that sci-fi touch too. I thought Michonne should have been more concerned about getting Crazy Cheez on her new shirt.